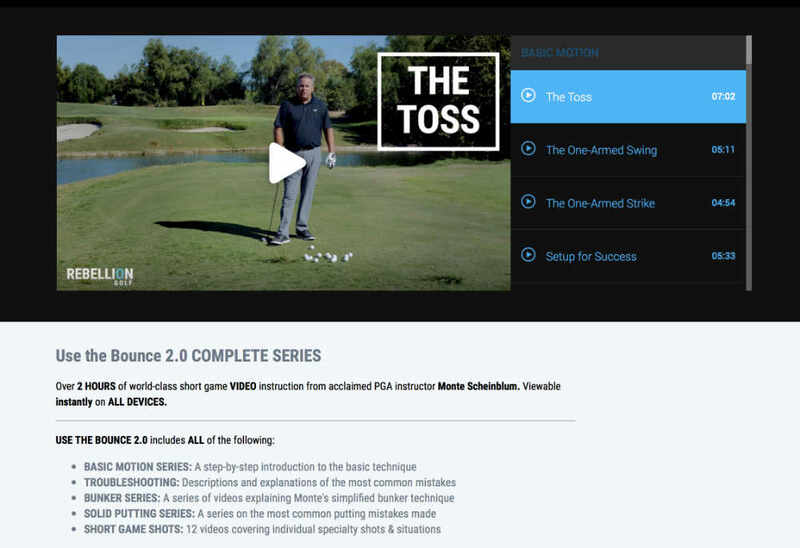 I’m pleased to announce that my new short game video series, Use the Bounce 2.0, is now available for instant streaming on my new website, Rebellion Golf. This is an entirely new, massively updated, and refined take on my current short game philosophy. It’s well over twice as long as my original short game video, and covers a range of topics I didn’t touch upon in that video. I cover new shots like THE EASY FLOP SHOT, COMPLETELY EXPANDED AND IMPROVED BUNKER TECHNIQUES, LOOSE LIES, THE HYBRID CHIP, BUMP & RUN, PUTTING, and several more. It’s a completely new set of videos teaching a ton of new techniques. So if you owned my old short game video, this one is still for you. And if you’ve never heard of me or my “old short game video”, then you’re in luck, as this is not a bloated Hollywood sequel. No previous experience required! And frankly, it’s hard to disagree with that logic. 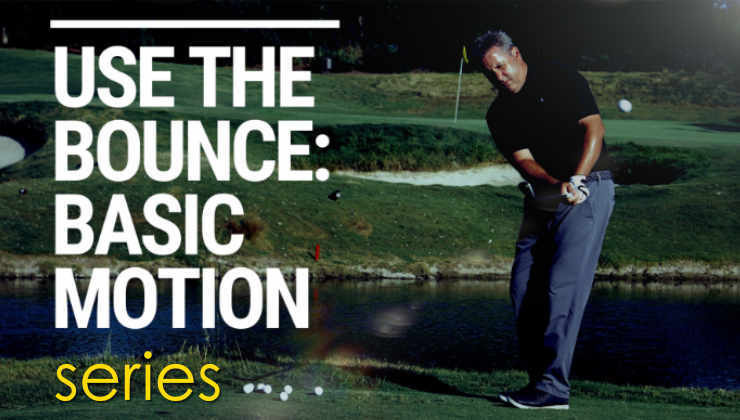 In turn, prior to the release of the original USE THE BOUNCE short game video, I had a hard time getting people to listen to me when it came to the short game. But after USE THE BOUNCE came out, things started to turn around. Suddenly the neanderthal had short game students. Even PGA tour players! And so, in the four years between these two videos, I had the pleasure of giving hundreds and hundreds of short game lessons to students who were suddenly receptive to my ideas. And this is why I say that this new video is enlightened. Only a fool could teach over a thousand people to chip without learning anything about how to improve that process along the way. 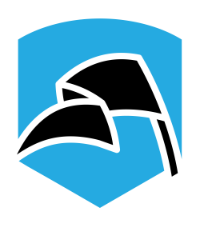 So again, modesty aside, this new video series is much, much, better, not because it’s new, but rather because I am now a much better short game instructor than I was in 2014. One of the things I’m trying to learn to do on video is to break down certain kinds of mechanics into basic, sequential steps. Anybody who follows my general teaching philosophy understands my initial reversion to the concept of STEP 1: do this, STEP 2: do that. I rarely teach that way in-person, because I find it much more beneficial to hone in on an individual’s flaw than it is to apply a cookie-cutter method to the golf swing. 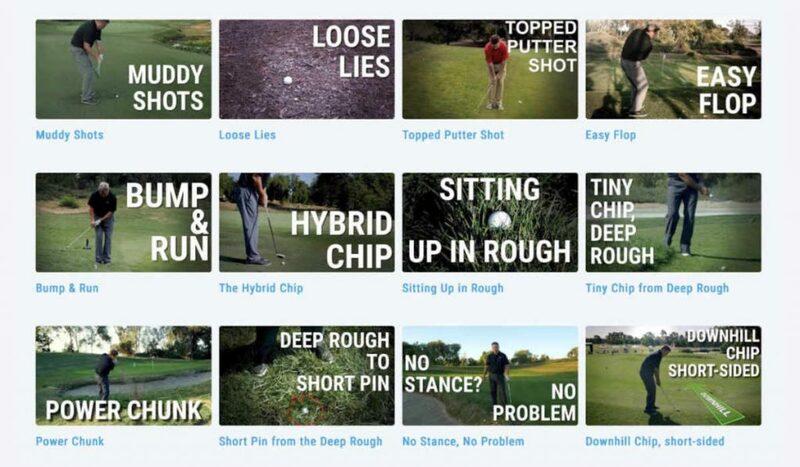 But when it comes to video, and especially to short game, I have learned (or rather, been told hundreds of times) that I needed to update my thinking in that regard. 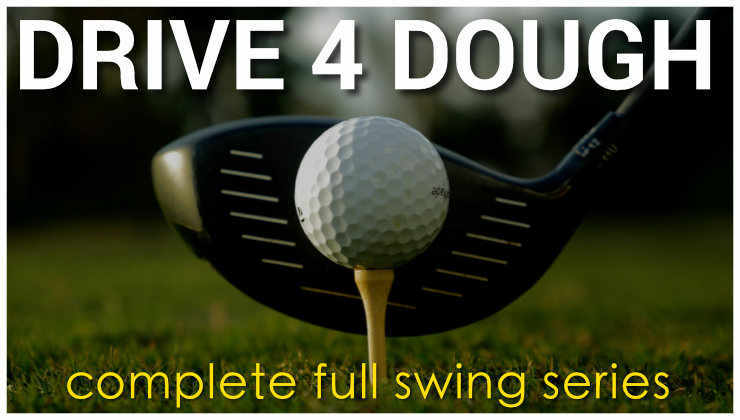 And so, USE THE BOUNCE 2 includes a BASIC MOTION SERIES that takes the viewer step-by-step through a series of movements designed to teach them my basic chipping method. We start by tossing balls at the target without a club, and end up doing drills that are more difficult than actually hitting a chip shot. 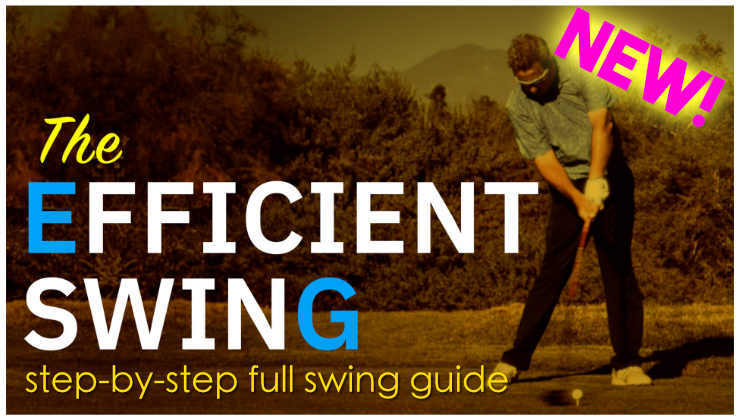 The idea is to walk the viewer through a progression that begins with something hilariously basic (tossing balls), and ends with a legitimately great, easy-to-learn chipping motion. Of all the things I teach in golf, my basic bunker technique is probably the least conventional. And as many of you know, I don’t defy convention for the sake of being cute. I go against the grain when I see golfers struggling mightily to execute basic bunker shots, over and over and over again. 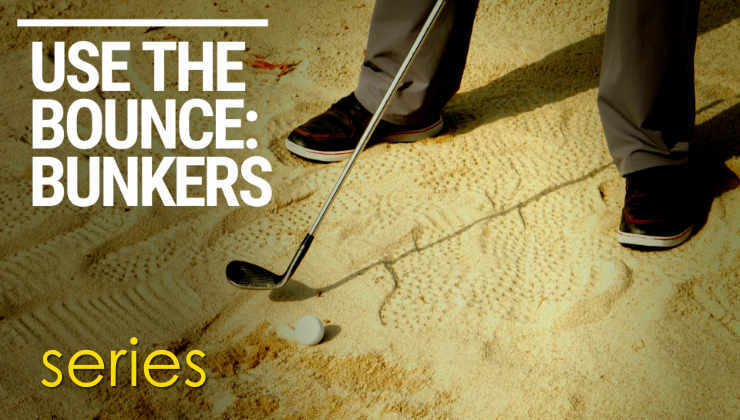 The basic bunkers section of the video begins with one of my patented diatribes about the ruinous conventional wisdom of bunker technique, and goes on to teach you a MUCH EASIER, BETTER, SIMPLER way. Many students have expressed confounded amusement at just how easy and straightforward my bunker technique is compared to some of the more popular methods out there. Now everybody gets a turn to realize firsthand that conventional bunker technique is basically terrible. The other exciting part of this new release is that it is my first video to be released on my new website, Rebellion Golf. Now that’s exciting because, for the first time ever, people can purchase my videos and immediately begin watching them in full 1080P glory, online, using any and all of their devices that handle something like Netflix. But even better, the Rebellion Golf website is built on a streaming video platform that allows me to break the video up into many individual chapters. This means you can now jump to whichever subject you want to watch and start there instantly. 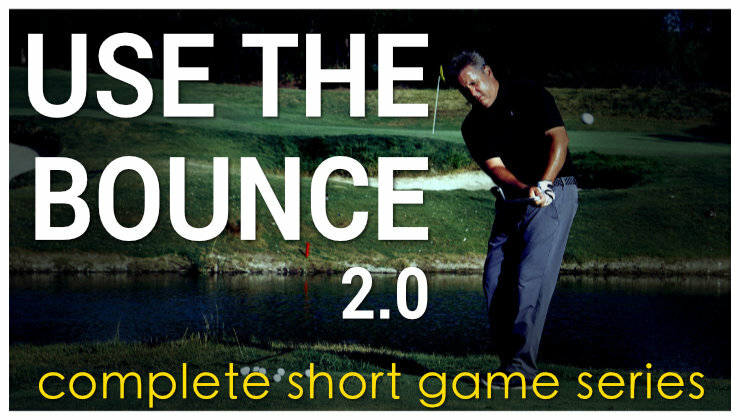 A few highlights from the original USE THE BOUNCE, and all of the situational short game videos from CALL YOUR SHOT are included with your purchase of USE THE BOUNCE 2.0 at no additional charge. And no, we aren’t counting those old videos when we say that this new video series is over two hours long. We want USE THE BOUNCE 2.0 to be a comprehensive short game series, so naturally, it just made sense to give you guys everything we had in the archives (that wasn’t replaced by new content) to go along with everything that is new. Each chapter of USE THE BOUNCE 2.0 features a comments thread where you can ask yours truly about questions related to the videos. I like to think of this as a FREE SUPPORT PLAN with your purchase. Ask me anything you want about the short game, right on the website, and I’ll get back to you in short order. Right now, you will need to use a facebook account in order to post, but we plan on having a proper forum for paying customers in the first half of 2018 as well. We have a lot planned for Rebellion Golf in 2018. In the meantime, do yourself a favor and give what I believe to be the best short game instruction out there a try. It’s $49. You’ll have it forever as this is not a subscription product. I think it’s a video series that you will watch once straight through, and use as a reference for years to come. You can purchase it here. If you haven’t purchased Monte’s short game video you are costing yourself at least 3 shots per round and that’s not an overstatement.